What does A B C mean on pottery? The Second World War proved a particularly difficult period for the British pottery industry because severe restrictions were placed on the production of decorated pottery. Production was concentrated in a reduced number of factories in order to save materials, energy and labour as these were needed elsewhere for the war. This “concentration” of the industry was a restructuring to allow people to leave the the pottery trade to work in the armed forces or industries in demand for the war effort. Decorated pottery required a lot of man-hours and energy costs for extra firing in the kilns. These were to become luxuries generally denied to the home market, but some production would continue for sale abroad in order to earn foreign currency. The domestic market would soon get used to plain, undecorated tableware. 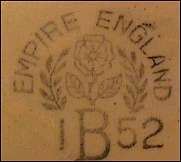 The process was initiated in the autumn of 1941, but by the summer of 1942 they were extended to restrict the sale of decorated pottery in the home market. Some restrictions were relaxed in 1945 and subsequent years but they were not fully lifted until August 1952. In 1941, British pottery production was subject to a Concentration Scheme whereby individual firms were classified as: nucleus, concentrated or closed-down. In 1942, maximum retail prices were set and letters such as A, B or C incorporated in the backstamp. The Scheme was revised in 1945 as the 'Domestic Pottery (Manufacture and Supply) Order' and additional letter groups BY, CY and CZ created. The firms on the following pages have been licensed to make undecorated domestic earthenware under the above Order. They are grouped according to the maximum prices which may be charged for their ware, having regard to their costs of production. and manufacturers in Group IV with the letter A. In addition, there are two further groups for jugs and pudding bowls only, Groups V and VI. 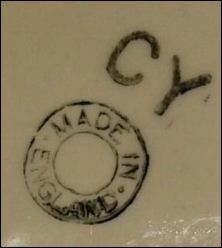 Manufacturers in these groups must mark wares controlled under the Order with the letters CY and CZ respectively. Ware to be Marked with the letter C.
Charles H. Brannam, Ltd., Litchdon Pottery, Barnstaple, Devon. Thomas Brian, Ltd., Longton, Stoke-on-Trent. T. Brown & Sons, Ltd., Ferrybridge, Yorks. (CZ for jugs and pudding bowls). Cartwright & Edwards, Ltd., Longton, Stoke-on-Trent. Alfred Clough, Ltd., Longton, Stoke-on-Trent (CZ for jugs). Colclough China, Ltd., Longton, Stoke-on-Trent (A for mugs, jugs and beakers). Coopers (Anchor Pottery), Ltd., Hanley, Stoke-on-Trent. Elijah Cotton, Ltd., Hanley, Stoke-on-Trent (CY for jugs). Dennis (Fenton), Ltd., Fenton, Stoke-on-Trent (CZ for pudding bowls). Devonmoor Art Pottery, Ltd., Liverton, Newton Abbot, Devon. Donyatt Pottery, Ltd., Ilminster, Somerset. A. T. Finney, Longton, Stoke-on-Trent. T. G. Green & Co,, Ltd., Church Gresley Nr. Burton-on-Trent (for pudding bows only). Howard Pottery Co., Ltd., Shelton. Stoke-on-Trent (for teapots only). 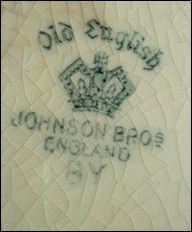 Johnson & Sons (Atherton), Ltd., Smallbrook Potteries, Atherton, Lanes. David Lockhart & Sons, Ltd., 54, Cognn Street, Pollokshaws, Glasgow. Longpark Pottery Co., Ltd., Newton Road Torquay. Chas. W. McNay & Sons. Brldgeness Pottery, Bo'ness, Scotland (CZ for jugs). C. T. Maling & Sons, Ltd., Newcastle-on-Tyne, 6 (CZ for jugs). Mason, Cash & Co., Ltd., Church Gresley, Nr. Burton-on-lrent (CZ for pudding bowls). New Hall Pottery Co., Ltd., Hanley, Stoke-on-Trent. 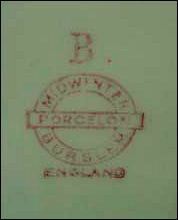 Price Bros. (Burslem), Ltd., Burslem, Stoke-on-Trent (B for mugs and. beakers and A for jugs). James Sadler & Sons, Ltd., Burslem, Stoke-on-Trent (CZ for jugs, A for beakers). Smith & Warrilow, Hanley, Stoke-on-Trent. Swinnertons, Ltd., Hanley, Stoke-on-Trent (CZ for jugs and pudding bowls). John Tarns, Ltd., Longton, Stoke-on-Trent. Torquay Pottery (1932), Ltd., Hele Village, Torquay. Trent Tiles (Botteslow) Co., Ltd., Hanley, Stoke-on-Trent. Wearside Pottery Co., Millfield, Sunderland. J. H. Weatherby & Sons, Ltd., Hanley, Stoke-on-Trent (for pudding bowls only). Arthur Wood & Son (Longport), Ltd., Longport, Stoke-on-Trent (A for jugs). Ware to be Marked with the letter B.
Wm, Adams & Sons (Potters), Ltd., Tunstall, Stoke-on-Trent (C for pudding bowls). Albert Potteries, Ltd., Burslem, Stoke-on-Trent. Geo. L. Ashworth & Bros., Ltd., Hanlev Stoke-on-Trent. Barker Bros., Ltd., Longton, Stoke-on-Trent. Barlows (Longton), Ltd., Church Street, Longton. Barratt's of Staffordshire, Ltd., Burslem, Stoke-on-Trent. Bovey Pottery Co., Ltd., Bovey Tracey, Devon. Burgess & Leigh, Ltd., Burslem, Stoke-on-Trent. Davison & Son, Ltd., Burslem, Stoke-on-Trent. Dunn, Bennett & Co., Ltd., Burslem, Stoke-on-Trent. 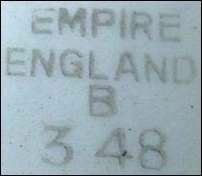 Empire Porcelain Co., Stoke-on-Trent (A for jugs). Furnivals (1913), Ltd., Cobridge, Stoke-on-Trent. Gibson & Sons, Ltd., Burslem, Stoke-on-Trent (C for pudding bowls). Globe Pottery Co., Ltd., & Ridgways (Bedford Works), Ltd., Shelton, Stoke-on-Trent. T. G. Green & Co., Ltd., Church Gresley, Burton-on-Trent (C for pudding bowls). Grindley Hotel Ware Co., Ltd., Tunstall, Stoke-on-Trent. Hollinshead & Kirkham, Tunstall, Stoke-on-Trent. Thos. Hughes & Son, Ltd., Longport, Stoke-on-Trent. George Jones & Sons, Ltd., Crescent Potteries, Stoke-on-Trent. James Kent, Ltd., Longton, Stoke-on-Trent. John Maddock & Sons, Ltd., Burslem, Stoke-on-Trent. Myott, Son & Co., Ltd., Hanley, Stoke-on-Trent (for cups only). Palissy Pottery, Ltd., Longton, Stoke-on-Trent. Pountney & Co., Ltd., Fishponds, Bristol. A. G. Richardson & Co., Ltd., Cobridge, Stoke-on-Trent. Sampson Bridgwood & Son, Ltd., Longton, Stoke-on-Trent. Shorter & Son, Ltd., Stoke-on-Trent. Simpsons (Potters), Ltd., Cobridge, Stoke-on-Trent. Sylvan Pottery, Ltd., Hanley, Stoke-on-Trent. Wade, Heath & Co., Ltd., Burslem, Stoke-on-Trent (for jugs only). Washington Pottery, Ltd., Hanley, Stoke-on-Trent. J. H. Weatherby & Sons, Ltd., Hanley, Stoke-on-Trent (C for pudding bowls). Wedgwood & Co., Ltd., Tunstall, Stoke-on-Trent. A. J. Wilkinson, Ltd., Burslem, Stoke-on-Trent. Wood & Sons, Ltd., Burslem, Stoke-on-Trent. Ware to be Marked with the letters BY. W. H. Grindley & Co., Ltd., Tunstall, Stoke-on-Trent. Johnson Bros. (Hanley), Ltd., Hanley, Stoke-on-Trent. Alfred Meakin (Tunstall), Ltd., Tunstall, Stoke-on-Trent. Myott, Son & Co., Ltd., Hanley, Stoke-on-Trent (B for cups). 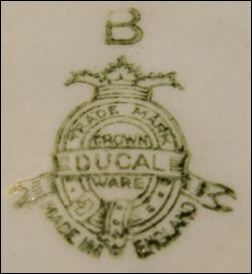 Ware to be Marked with the letter A.
Belleek Pottery, Ltd., Belleek, Co. Fermanagh, N. Ireland. John Beswick, Ltd., Longton. Stoke-on-Trent (C for teapots and coffee pots). Carter, Stabler & Adams, Ltd., Poole, Dorset. 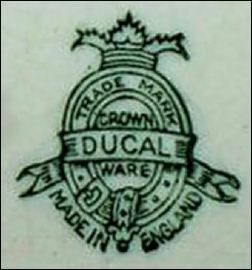 Geo, Clews & Co., Ltd., Tunstall, Stoke-on-Trent (for mugs, jugs and beakers only). Colclough China, Ltd., Longton, Stoke-on-Trent (for mugs, jugs and beakers only). W. T. Copeland & Sons, Ltd., Stoke-on-Trent. Ellgreave Pottery Co., Ltd., Burslem, Stoke-on-Trent (for jugs and beakers only). S. Fielding & Co., Ltd., Stoke-on-Trent. Thos. Forester & Sons, Ltd., Longton, Stoke-on-Trent. Lancaster & Sandland, Ltd., Hanley, Stoke-on-Trent. Thos. Lawrence (Longton), Ltd., Longton, Stoke-on-Trent. R. H. & S. L. Plant, Ltd., Longton, Stoke-on-Trent. Price Bros. (Burslem), Ltd., Burslem, Stoke-on-Trent (for jugs only). Shaw & Copestake, Ltd., Longton Stoke-on-Trent. R. C. Southcliffe, Cardiff, S. Wales. Wiltshaw & Robinson, Ltd., Stoke-on-Trent. Ware to be Marked with the letters CY. Elijah Cotton, Ltd., Hanley, Stoke-on-Trent (for jugs only). Ware to be Marked with the letters CZ. T. Brown & Sons, Ltd., Ferrybridge, Yorks. (for jugs and pudding bowls only). Clokie & Co., Ltd., Castleford, Yorks. (for jugs and pudding bowls only). Chas. W. McNay & Sons, Bridgeness Pottery, Bo'ness, Scotland (for jugs only). C. T. Maling & Sons, Ltd., Newcastle-on-Tyne, 6 (for jugs only). Mason, Cash & Co., Ltd., Church Gresley, Nr. Burton-on-Trent (for pudding bowls only). James Sadler & Sons, Ltd., Burslem, Stoke-on-Trent (for jugs only). Swinnertons, Ltd., Hanley, Stoke-on-Trent (for jugs and pudding bowls only).